"Bullecourt, more than any other battle, shook the confidence of Australian soldiers in the capacity of the British command; the errors, especially on April 10th and 11th, were obvious to almost anyone." The Second Battle of Bullecourt, fought between 3 and 15 May 1917, was a continuation of the British 1917 spring offensive north and south of Arras. The aim of the spring offensive was to support a major attack further south by the French under General Robert Nivelle. 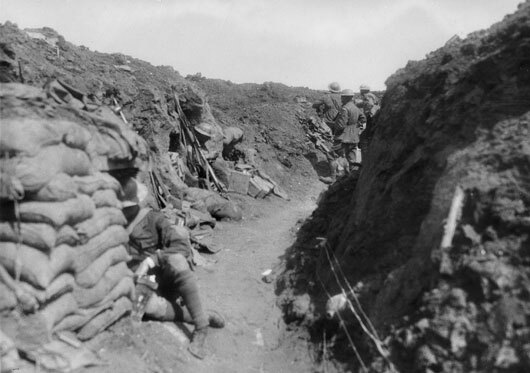 As the British had at the opening of the Somme in 1916, Nivelle sought a breakthrough of the German lines followed by swift defeat of the enemy on French soil. The French attacked on 15 April 1917 but failed. 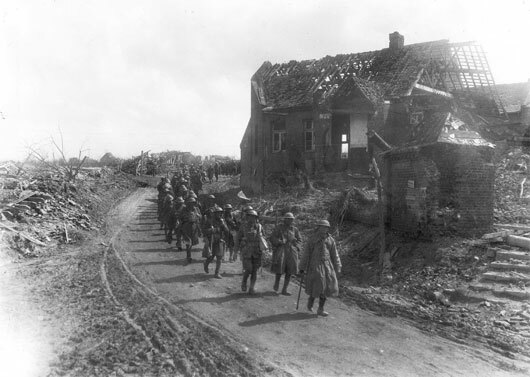 However, both British and French leaders agreed to continue operations, one of which was a combined British and Australian attack on the Hindenburg Line around Bullecourt where the Australians had failed so disastrously on 11 April 1917. The infantry of the Second Australian Division advanced east of Bullecourt village at 3.45 am on 3 May 1917. The left flank, close to Bullecourt, was pinned in the wire but the right and centre, partly sheltered by a half-sunken road, seized and cleared the first two lines of enemy trench. At dusk on 3 May, the Australians held most of its first objective. Only the Canadians in the north and the Australians in the south made any progress on 3 May. The Australians extended their narrow foothold in the Hindenburg Line until it was like a mushroom on its stalk, with the head deep in enemy territory connected by a single long communication track. At dawn on 6 May, after 18 hours of bombardment, the Germans launched their sixth general counter-attack but stubborn defence by Australians prevented any German gain. Part of Bullecourt was seized by the British on 7 May and ten days later all the ruins were in their hands. On 15 May, the Australians fought off a final German counter-attack and the enemy decided to leave this piece of the Hindenburg Line to the Australians. 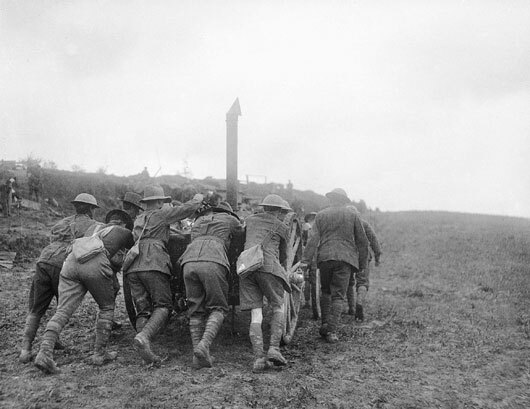 Members of the 6th Brigade bringing one of their field kitchens into position during heavy fighting near Bullecourt (AWM E00437). 8th Battalion sentries in the western portion of the Hindenburg Line, captured fighting for Bullecourt (AWM E00439). 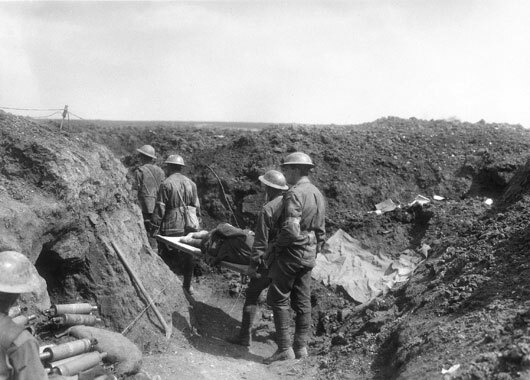 Stretcher bearers carrying the wounded back along the trenches during fighting at Bullecourt (AWM E00440). 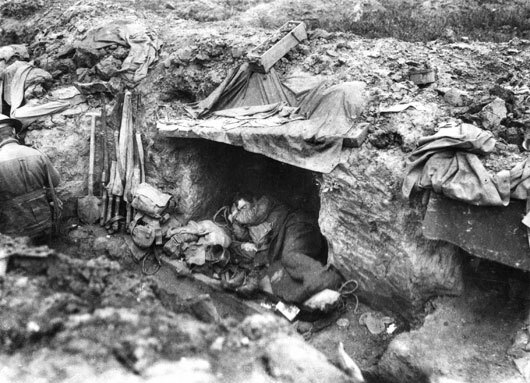 An Australian soldier sleeping in his trench shelter during fighting near Bullecourt (AWM E00455). 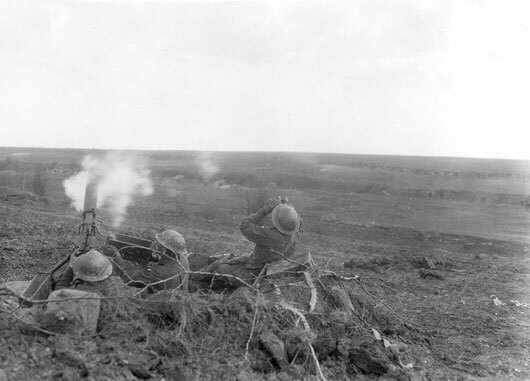 A section of the 22nd Machine Gun Company shooting at a German aircraft flying low over the Bullecourt battlefield (AWM E00458). 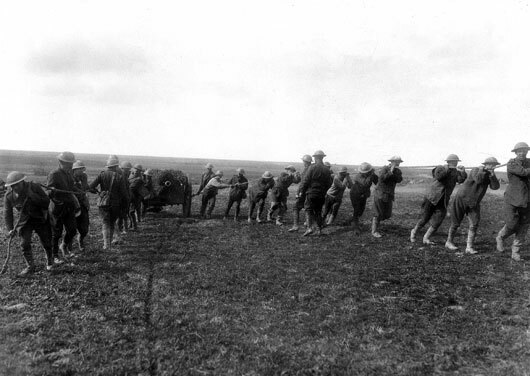 Gunners of the 16th Battery, Australian Field Artillery, pulling an 18 pounder gun into position (AWM E00463). Australian soldiers coming out of the line for a rest, passing through the ruined village of Vaulx (AWM E00589). 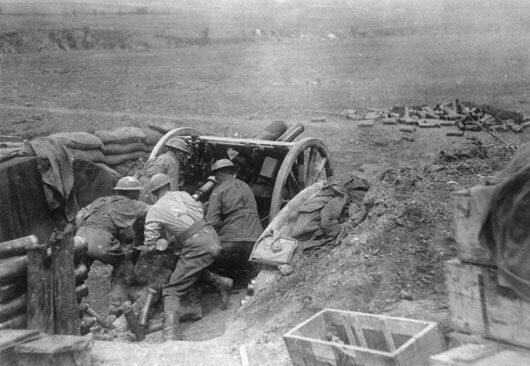 Three members of the Australian Field Artillery using an 18 pounder gun in the battle for Bullecourt (AWM E00600).